Osteoarthritis (OA) affects tens of millions of Americans and is a leading cause of disability and reduced quality of life across the globe. Joint pain can affect physical mobility and our daily chores and activities. 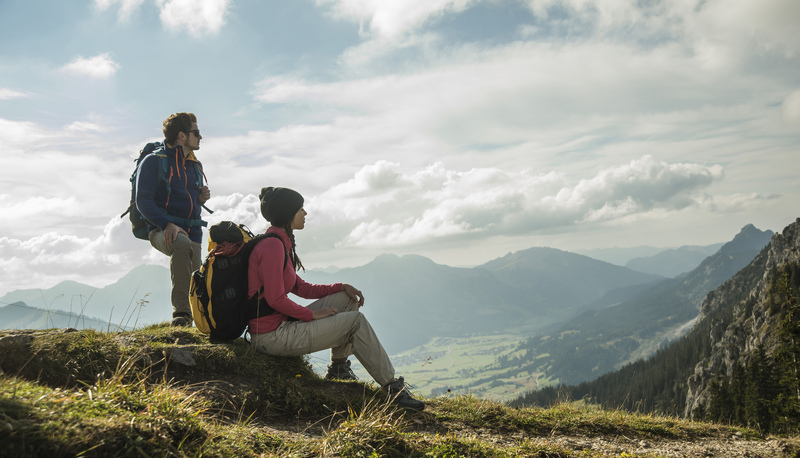 Celergen can help you start living an active, pain-free life within weeks without painkillers or surgery. It’s a proven natural remedy to manage osteoarthritis pain effectively and naturally without any negative side effects. 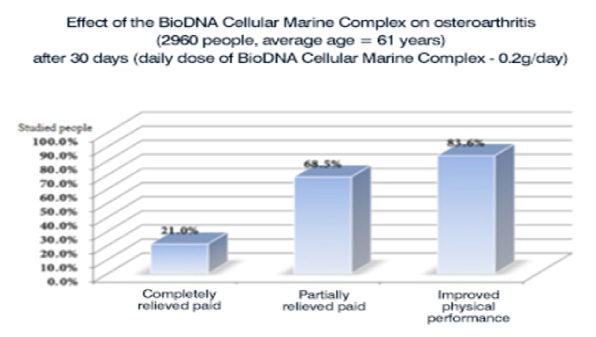 This figure shows the effects of 200 mg/day of Bio-DNA Cellular Marine Complex given orally for 30 days for 2,960 clinical subjects with an average age of 61 years. About 21% of the subjects reported complete relief of their joint pain and 83.6% reported significant physical improvement. 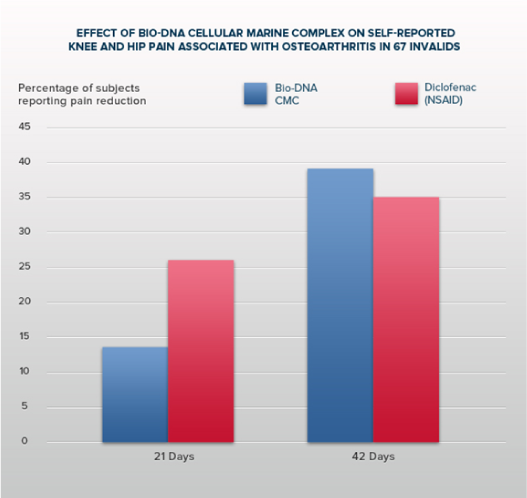 This figure shows the effects of 200 mg/day of Bio-DNA Cellular Marine Complex (Bio-DNA CMC) given orally for 21 days and 42 days respectively, on self-reported knee and hip pain associated with osteoarthritis in 67 invalids. The effects of Diclofenac, a painkilling non-steroidal anti-inflammatory drug (NSAID) is also provided for comparison. At 21 days, just under 15% of invalids treated with Bio-DNA CMC reported significantly less knee and hip pain, compared to just over 25% for Diclofenac. At 42 days, nearly 40% of invalids reported a significant reduction in their knee and hip pain with Bio-DNA CMC, relative to 35% with Diclofenac. While we are fairly good at acute pain management, many chronic pain conditions such as OA, low back pain, and others are harder to treat effectively. 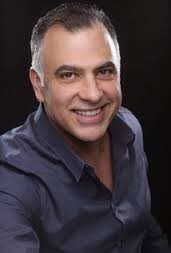 Many researchers in the field believe that a multidisciplinary team (which includes health care providers with different backgrounds) working together to use a number of different approaches to manage pain offers the most effective way of managing chronic pain.